Chicago based creative studio Nomo has designed a series of posters featuring the runway patterns from some of the world’s busiest airports. They measure 18″ x 24″, and are printed with white ink on Steel Gray 100# Dur-O-Tone paper by French Paper Co. So far three of American’s five cornerstone airports (JFK, LAX and ORD) plus LHR and SFO are available, but more are on the way. 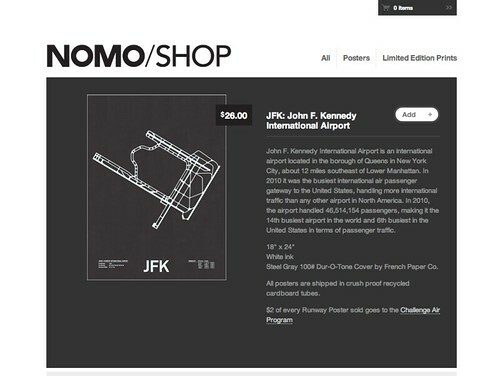 You can purchase them online for $26 from the Nomo Design Store. Don’t miss my my drawing to win one of the newly redesigned American Airlines premium class amenity kits with the Eames Office pattern. I’ll be announcing the winner on Monday, so if you haven’t done so already, go here to enter. Also, The Weekly Flyer over at Points, Miles & Martinis is giving away an Admirals Club day pass. His giveaway also runs all weekend, so go here to enter. Ooh, very cool, I may get a MSP one to dream of home. And they give $2 of each to charity, the Challenge Air Program. Nice find! That makes for a nice gift to give a travel lover or aviation enthusiast. @ Rapid Travel Chai – Thanks for pointing it out. Challenge Air builds self-esteem and confidence of children and youth with specials needs, through the experience of flight. What a great way to do something for your wall and help others. I just wish they had one for DFW, or better yet, TUL. @ Michael W – Thanks! This will be great decoration on my wall. @ lunaticg – Thank you. After looking at all the posters I realized I need more wall space!